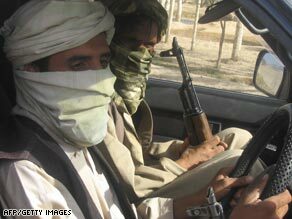 KABUL, Afghanistan (CNN) -- A top Taliban commander has issued a new threat to foreign aid workers, saying that under the insurgent group's new "constitution" they will execute them as spies or hold them in exchange for the release of Taliban fighters. In an exclusive telephone interview Friday night with CNN, Mohammed Ibrahim Hanafi said the Taliban intelligence wing was actively gathering information on foreign aid workers. "If we get someone, that is how we will deal with it under our new constitution," he said. He added that he was telling "Afghan brothers not to work with NGOs." In the 15-minute interview, arranged by an intermediary for CNN, Hanafi repeated the Taliban's pledge to keep girls out of public schools. "Our law is still the same old law which was in place during our rule in Afghanistan," he said. "Mullah Mohammad Omar was our leader and he is still our head and leader and so we will follow the same law as before." "In my opinion," he added, "Taliban aren't allowing girls to go to schools because Taliban want women to preserve their respect by staying in their homes, not to work as laborers for others." Blog: Why interview the Taliban? The schools that did open, however, remain defiant. Young women admitted to CNN being fearful but also said they are determined to get an education and better their lives. It is a sentiment echoed by their principal, a 35-year veteran of Afghanistan's girls schools. "I am asking those who close schools and throw acid on girls to let the children of this country go to school because it's crime to close the schools, a crime against the children of this country," said Safia Hayat, principal of the Zarghona Girls School in Kabul. Hanafi, meanwhile, went on to discuss possible reconciliation talks with the Afghan government. "I don't think there can be any discussion of peace until the the foreigners leave Afghanistan," he said referring to the presence of coalition troops. While he seemed to confirm that some reconciliation talks were ongoing, Hanafi also said he wondered what kind of peace was possible as long as Afghans are still dying in NATO bombardments. Hanafi described himself as a commander in the southern province of Helmand, but announced a new Taliban offensive in the north was about to begin and that he would be playing a key role there.